We all know our students learn in diverse ways. Some are better visual learners, others may be hands on learners, and some are a combination. For students who are auditory learners and learn better when they hear material as opposed to reading it, I suggest using audio books. These are versions of textbooks or literature that are read to the student. These are especially helpful for students with reading disabilities, such as dyslexia, visual impairments/blindness, or physical disabilities. Bookshare is a resource that is free for any students who have a qualifying disability. See here for specifics, but any learning/ reading, visual, or physical disability qualifies for a free membership. This organization offers a large library of books, including textbooks, literature for ELA classes, and books for leisure reading. Their books are available as eBooks to be read on computers, phones, and tablets. This resource is only free for students and qualifying members, and has an annual fee for users who are out of school. There are several apps available that help turn these eBooks into audio books. You simply upload the book into the app, and use the built-in text-to-speech capabilities of the app to read the text aloud. The best part about these apps is that they work with the technology that our students already have, be it smart phones or tablets. Voice Dream Reader integrates with Bookshare to read books out loud. It can also read files from PDF, MS Word, ePub, and text files through Dropbox and Google Drive. Voice Dream Reader offers many adjustable features including reading speed, highlighting, reduced text area, customizable font, including font size and color, as well as 36 free voices and 146 premium voices offered as in app purchases for $1.99 or $2.99. The app itself costs $9.99 and is available as a free demo version. 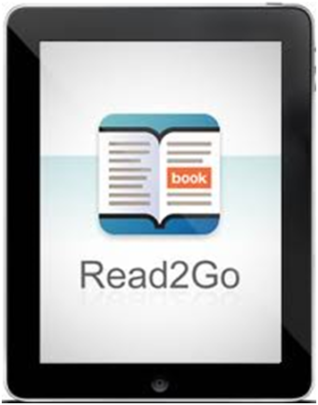 Read2Go is an Apple app that connects directly to Bookshare. With this app you can search, download, and read Bookshare books. The app offers features of adjusting font size and color, highlighting options, background colors, and text to speech options. The app syncs with Apple’s accessibility features of VoiceOver and has the ability to sync with a Bluetooth Braille keyboard (see my blog post on accessibility features for more info). This app costs $19.99. Go Read is another accessible e-book reader for Android products. Go Read lets users download and listen to books on Android smartphones and tablets, including the Nook HD/HD+. Go Read is free. Anyone have any success with other text-to-speech apps? Let us know! Sign up for our mailing list here to stay updated with our latest therapy tips, app announcements, and blog posts. Don’t forget to follow us on Twitter, Pinterest, and like us on Facebook!